Parrot has unveiled its latest drone. The new ANAFI not only allows for 4K video in both live and recorded formats, but also has a high-end FLIR mode for thermal imaging. It can fly over potential dangerous hot-spots for up to 26 minutes on a single battery's charge for professional-grade safety and thermal gradient monitoring. 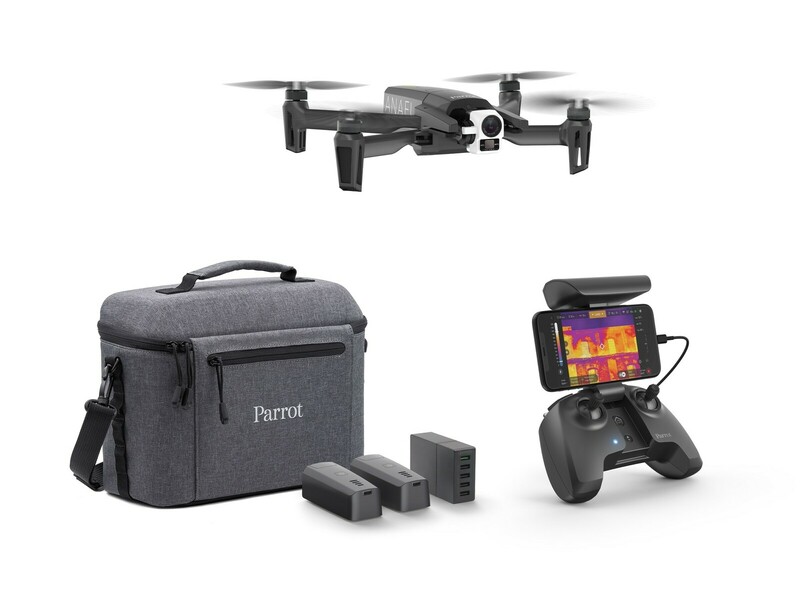 Parrot has announced its latest drone, the ANAFI 4K quadcopter-style robot. This device will be of serious interest to professionals working in areas such as public safety, as it adds thermal imaging to a typical range of 4K aerial recording options. This latest addition to the ANAFI line packs a forward-looking infra-red (FLIR) radiometric camera with a resolution of 160 by 120. This allows the drone to measure and distinguish temperatures in a range from -10° Celsius (C) to 400°C (or 14° Fahrenheit (F) to 752°F). This camera is set on a gimbal that allows for a 180° range of movement. Therefore, the operator can get an optimal field of view when assessing the thermal profile of the surface, terrain or building in question. The new ANAFI's cameras (in both spectra) also have 3-axis stabilization for judder-free video in most flight conditions. Parrot claims that it can fly at up to 34 miles per hour (mph) against winds of up to 31 mph. It is compatible with the Skycontroller 3 remote control, which can maintain a WiFi connection for up to 1 mile, and allows video playback or streaming through a connected smartphone. The ANAFI thermal imaging drone will cost US$1,900, and will be available from May 2019. Those interested in a FLIR-enabled flying robot will be able to order one from parrot.com, Drone Nerds, B&H or Adorama.